The Republican says she wants a job where she could do the most for Mainers, but she would have to leave her U.S. Senate seat two years before her term ends. Sen. Susan Collins said Tuesday that she is seriously contemplating a run for Maine governor in 2018, the most definitive statement she has made on a topic that has long been the subject of political speculation. Maine’s senior senator has mostly demurred on the subject when questioned by reporters seeking to identify prospective candidates to succeed Gov. Paul LePage in the Blaine House. But in an interview Tuesday morning, the Republican told WGAN radio hosts Matthew Gagnon and Ken Altshuler in response to a question about her plans that she was giving serious thought to running. “Let me say that I am looking at where I can do the most good for the people of Maine,” said Collins, who has served in the Senate for 20 years. “In the Senate, I now have significant seniority and that allows me to do a lot. “Coming to be governor, if I were fortunate enough to be elected … you can work on issues I care a lot about like economic development, jobs, education. And I would try to heal the state and bring people back together, which I think is important as well. In an email to the Press Herald later Tuesday, Collins, 64, said she wouldn’t make a final decision until later this year. Collins’ comments were the most detailed expression of interest she has made in the office of governor since she ran for the job in 1994, losing to independent Angus King, who now serves alongside her in the Senate. Were Collins to run and be elected, she would have to resign her Senate seat with two years remaining in her term, setting up a scenario allowing LePage to appoint a replacement for the unexpired term. If elected, Collins would be Maine’s first female governor. In the interview, Collins was not asked to explain her comment about healing the state, but it appears to be a reference to the tumultuous and often controversial tenure of LePage, whose two terms have been marked by partisan polarization and an often hostile relationship with the Legislature, including, at times, members of his own party. Collins has long been one of Maine’s most popular politicians, with high voter approval ratings in most polls. Considered a moderate Republican in Washington, she has at times been at odds with the more conservative flanks of the Republican Party, especially on social issues. Collins supports abortion rights and also has been an outspoken advocate against discrimination based on sexual orientation. She holds several key committee assignments, including the Senate’s Select Committee on Intelligence, the Committee on Appropriations and the Committee on Health, Education, Labor and Pensions. Collins is chairwoman of the Special Committee on Aging and has been an advocate for older citizens. Collins won re-election to her U.S. Senate seat in 2014 handily, defeating Democratic challenger Shenna Bellows with 68 percent of the vote. Collins also won all 16 of Maine’s counties in 2014. In recent years, Collins has faced growing criticism from within her own party, especially from far-right conservatives, many of whom supported LePage and President Trump in 2016. In a guest column in The Washington Post in August 2016, Collins criticized Trump and noted she would not vote for him or his Democratic opponent, Hillary Clinton. “My conclusion about Mr. Trump’s unsuitability for office is based on his disregard for the precept of treating others with respect, an idea that should transcend politics. Instead, he opts to mock the vulnerable and inflame prejudices by attacking ethnic and religious minorities. Three incidents in particular have led me to the inescapable conclusion that Mr. Trump lacks the temperament, self-discipline and judgment required to be president,” Collins wrote in part. And while LePage and Collins have had frosty relations of late, she endorsed LePage in his re-election campaign in 2014, standing with him on the podium at the Maine Republican Party’s convention that year. Democrats also have criticized Collins, citing her support for Neil Gorsuch, Trump’s nominee to the U.S. Supreme Court who was confirmed by the Senate on Friday. They argued that Gorsuch is against abortion rights and could be a key vote on the issue were it to come before the high court again. But Collins also supported at least a Senate confirmation hearing for former President Barack Obama’s pick for the same seat, Merrick Garland. At the time, Collins sided with Democrats in calling for a fair review of Garland, although leaders in the Republican-controlled Senate did not allow that to happen. Collins also was among five Republicans who sided with Democrats in opposition to a proposed travel ban for visitors to the U.S. from a handful of predominantly Muslim countries. Collins also has parted ways with more conservative Republicans on gun issues and has voted in support of a federal law change that would expand federal background checks for gun purchases. She has received only a C+ ranking from the pro-gun National Rifle Association and a D- ranking from Gun Owners of America. 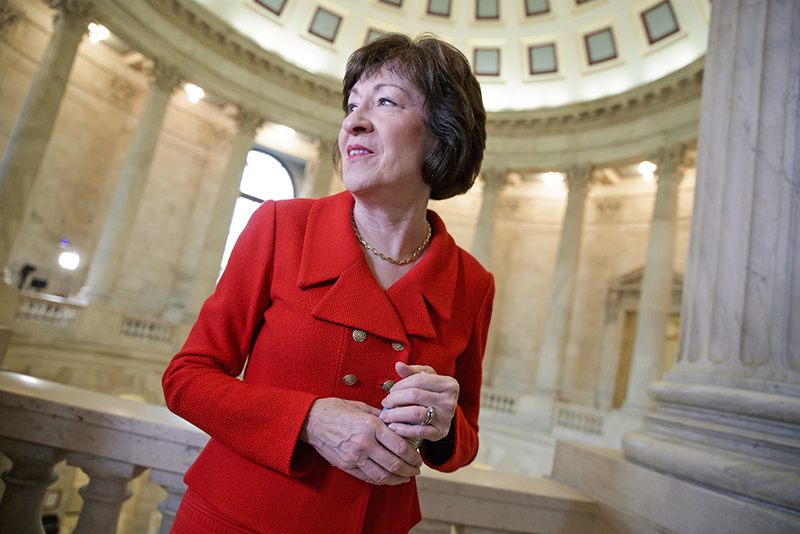 While some conservative Republicans have deemed Collins a RINO – a Republican in Name Only – Maine voters have continued to support her by wide margins, and many believe she would have an easy road to the Blaine House if she wanted it. As a gubernatorial contender, Collins would have a head start in fundraising with $936,454 in cash currently on hand, according to records on her campaign organization available from the Federal Elections Commission. She would join a growing field of possible candidates that includes both prominent and lesser-known Democrats, Republicans and independents. Among those who have confirmed they are considering a bid are Maine Attorney General Janet Mills, a Democrat, and former Maine Republican Party Chairman Rick Bennett. Bennett also has served as a state senator, including a term as Maine Senate president. Also on the short list for Republicans are Maine Department of Health and Human Services Commissioner Mary Mayhew and state Senate Majority Leader Garrett Mason, R-Lisbon. Democrats in the mix also include attorney and businessman Adam Cote, car dealership owner Adam Lee and former Speaker of the House Mark Eves. Shawn Moody, an independent who lost a bid for the governor’s office in the 2010 five-way race that LePage won, also has said he is weighing another run in 2018. Complicating Maine’s next gubernatorial race is a 2016 ballot question passed by voters that would move Maine to a ranked-choice voting system. Whether the new law will pass constitutional muster is still unclear, and the Maine Supreme Judicial Court will hear oral arguments on the new law Thursday in Augusta. A ranked-choice ballot could feature many candidates.